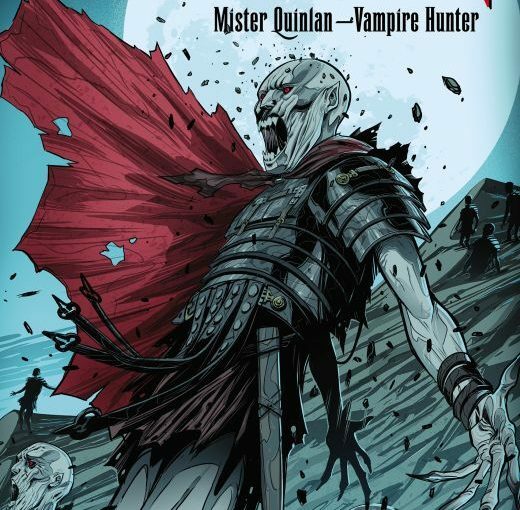 The Strain Mister Quinlan Vampire Hunter is one of those comics that would be better as a graphic novel, The Strain has always been a must-read series and this continues to deliver. 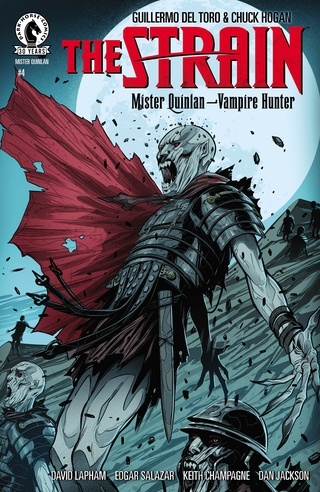 After being confronted by a mysterious Vampire, Quinlan is given an ultimatum, either help them take out Thax are be taken out himself, after agreeing the mysterious Vampire assigns an agent with Quinlan, the agent is a human name Decimu. The two are given a dangerous mission by Caesar in which they must intercept a legion in carthage, what makes the mission so dangerous is the Desert they must cross. 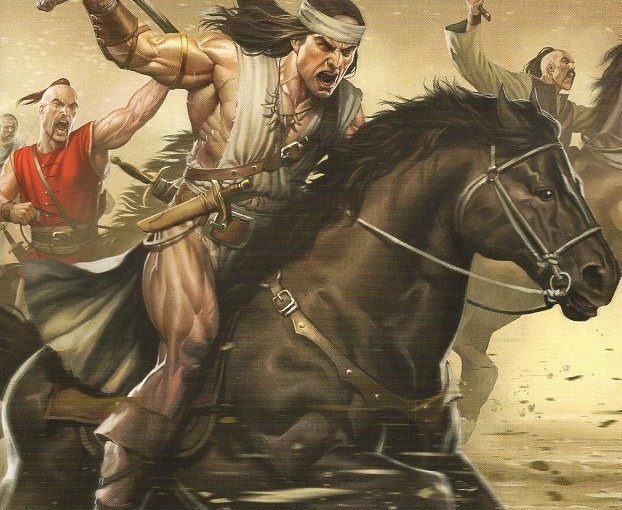 With little chances of survival Quinlan, Decimu and company make way, and not long during their travels the men start to break because of the heat. After taking shelter Quinlan and Decimu take a minute and talk, we find out Decimu’s reason’s for why he follows the mysterious vampire’s orders. Later during the night Marcus, a man part the legion Quinlan informs him that 30 men have gone missing after drinking all of the water rations, Quinlan notices a broken pottery in which the water was in, he’s shocked when he finds the parasites that carry the vampire infection were inside with the water. Knowing the missing men will soon turn, Quinlan and Decimu push the men to get as far away as possible because they know the newly turned vampires would be hunting them down fast. 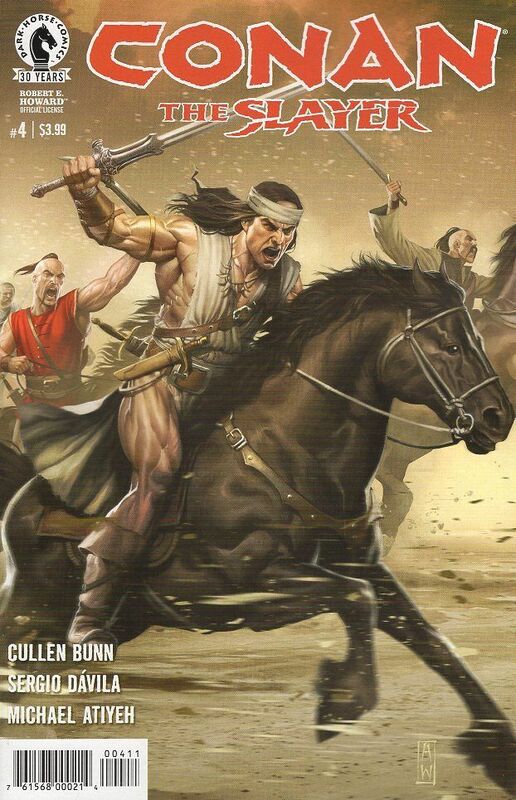 With the missing soldiers now hunting them Quinlan and company decide to stand their ground and take on the vampires, the fight lasted only an hour, but the causalities were heavy, they had lost over 100 men to and now only had 60. 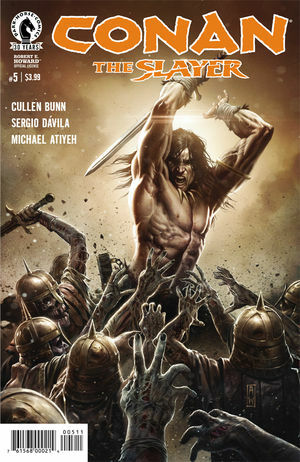 With sun up Quinlan and Decimu come up with a plan to find and attack the vampires while they sleep underground, Quinlan knew the plan was certainly death to them all they continue. Once they reached the layer, they attack the vampires as they sleep, although they had the upper hand by catching the infected off guard, they still couldn’t match the strength and numbers of the vampires and ended up losing all of their men including Decimu who somehow got infected during the fray. Conclusion: Nothing has changed for Quinlan he continues to struggle with humanity and not in a since of danger but of loss, Decimu was a true friend too Quinlan but he ended up losing his life in battle against the vampires, I wouldn’t blame him if he decides to view the world like Thax or like the ancient ones, the guys been through a lot and now he seems to be on his way of losing his own life. 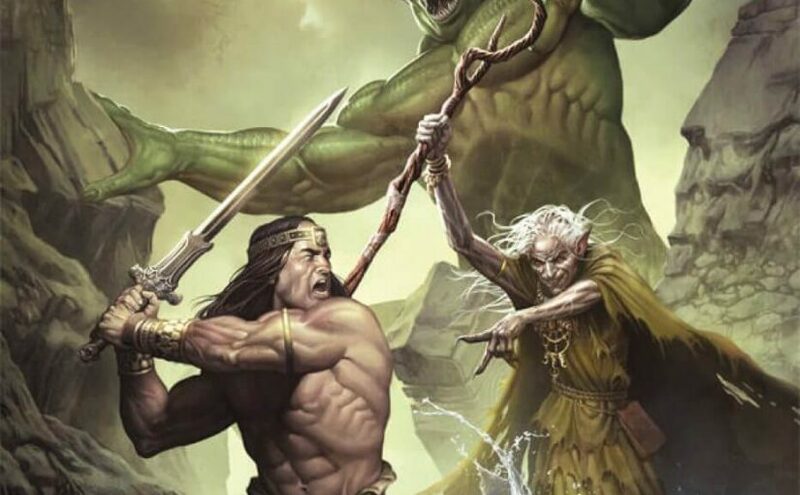 But some good was found out of all the drama, he discovered a new ability he can use if he can survive this latest Conan like predicament. 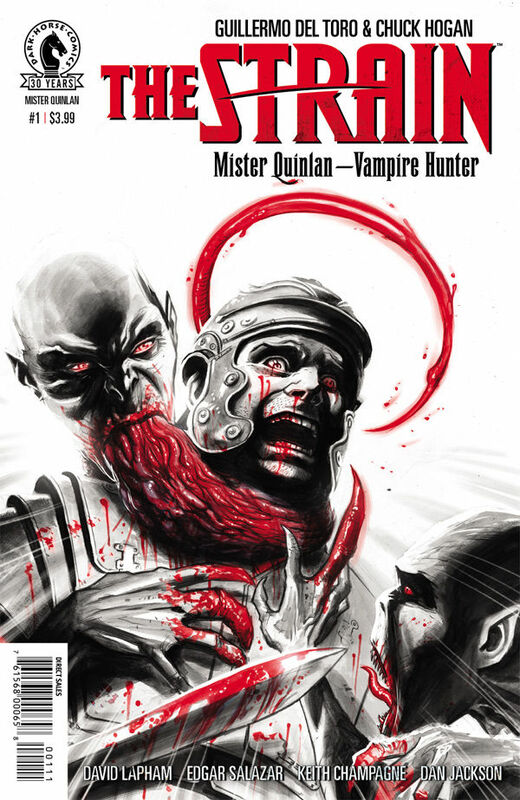 Guillermo Del Toro & Chuck Hogan’s The Strain: Mister Quinlan Vampire Hunter started off with a good first issue, we establish a solid plot along with interesting characters. At the end of the first issue Quinlan was sent to a Gladiator school and after 3 years was known throughout Rome for his victories, he soon found himself fighting Spiculus a famous gladiator and warrior he respected. 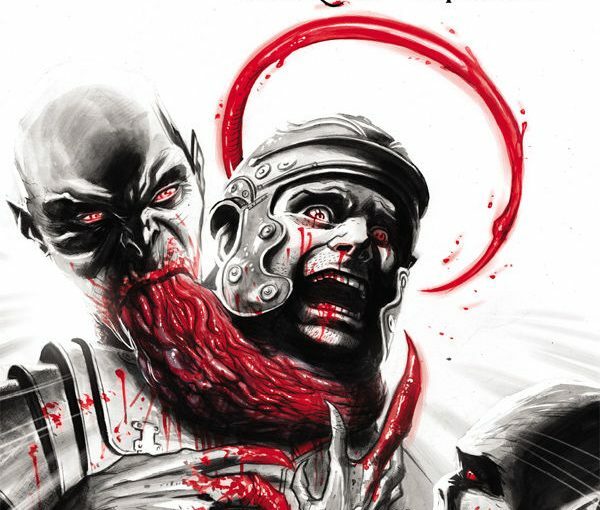 When the two of them finally fought Quinlan defeat him due to his vampire abilities, the victory causes the emperor to become enraged and calling for his head. Again Quinlan is in situation where he has to run, at the same time Thax snuck inside the emperor’s walls and its assume takes him out. Later that night an attack setup by Thax, which was setup at the end of the first issue is finally commencing. Surprisingly Spiculus and a few other gladiators come to aid them as they fight off Thax and his newly turned vampire’s, the fight was won but not without casualties, Quinlan’s only friend Bruk was bitten by a vampire and taken out by Quinlan. After hiding out for some time Quinlan is sold off to another slave owner only this time the man knows what Quinlan is and why he’s so different from the others like him. He’s taken to a room that is dark and filled with mysterious objects and artifacts, the man walks Quinlan up to a curtain, he is told that someone important has come a long way to see him, the person behind the curtain is an Ancient Vampire. The Ancient Vampire tells Quinlan in history there were 4 others like him that they considered an abomination and that he cannot be allowed to live. The ground work Guillermo Del Toro & Chuck Hogan’s The Strain: Mister Quinlan Vampire Hunter is coming along smoothly with David Lapham, the focus of the story stays around Quinlan and Thax, the two seem to have been destined to fight one another, and now that the Ancient Vampires have revealed themselves it looks as if things will get more exciting in the upcoming issues, and I can’t wait. In the first issue it ended with Sonia getting kidnapped while Kingsway and Ah Toy run into some trouble with local soldiers, we also get a glimpse of the main antagonist’s and their plans for the future. Early on in the issue we get a flashback of Kingsway and Sonia telling each other stories of their experiences of war, with promise of a new future the two of them agree to leave their past behind them and look towards a new life together. Back in the present Kingsway saves Ah Toy from the soldiers that attack her and again she asks him to come defend his people, but Kingsway again shoots the offer down telling Ah Toy that the people he saved also turned on him for the Queens reward. 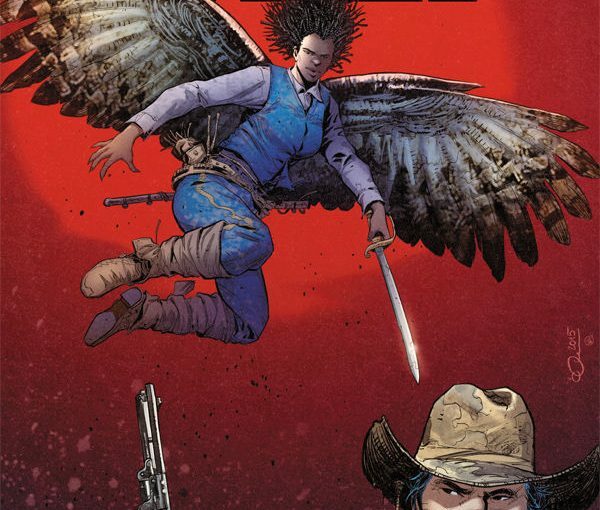 The issue takes an interesting turn when the two men we seen at the end of the first issue, who are now identify as Dr. Uhrmacher and Strode meet up with the woman with angel wings. We find out the Red Gold can give abilities, mutations and even bring back the dead. Clearly Red Gold is a precious commodity in the world of Kingsway and there’s many that would kill for it. Conclusion: While the story opened up a little bit more there are still a lot of question that will hopefully be answered, as of right now we only know the past of Kingsway and that Red Gold is powerful and hard to find. I find myself more interested in the antagonist then in Kingsway, again maybe that will change in future issues so I’ll wait until then. 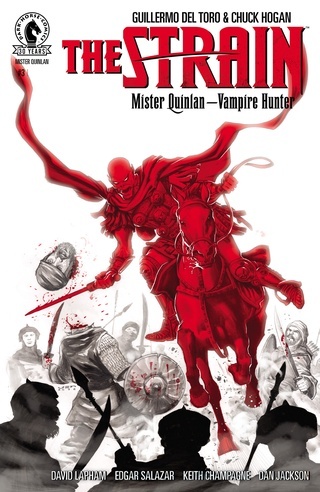 Guillermo Del Toro & Chuck Hogan’s The Strain: Mister Quinlan Vampire Hunter #1 tells the story of a hybrid vampire name Quinlan and his counterpart Thrax as they live in ancient Rome. The story starts with a little back story of the main antagonist Thrax, he lived as the right hand vampire of Emperor Caligula, one night a group of assassins sneak in and attempt to take Caligula’s life, instead they interrupt’s Thrax as he feeds on a pregnant slave. 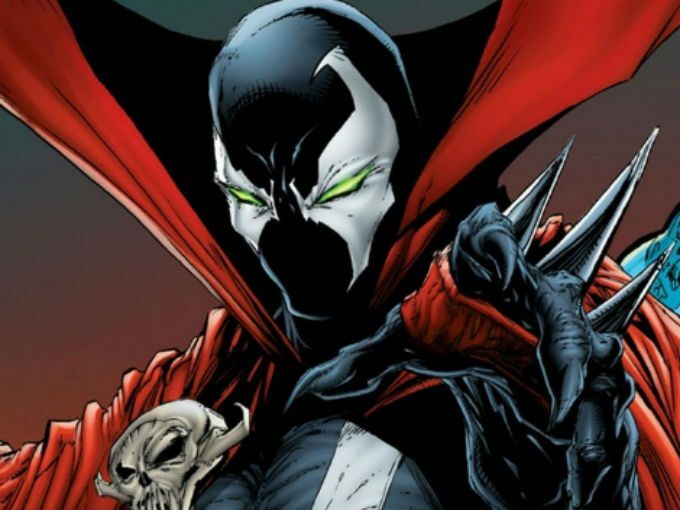 The woman escapes and runs away, over time she transforms into a vampire because of Thrax. 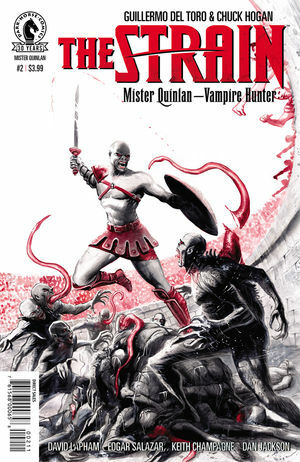 With Thrax on the run from roman guards the young woman takes refuge in a cave and eventually gives birth to a baby vampire who she names Quinlan, as time passed on the baby becomes a young adult, we see how his vampire abilities are different form the Thrax, the biggest difference is the immunity to sunlight. Most vampires can’t survive in sunlight and Thrax is no different, Quinlan on the other hand is the exception, because of his immunity to sunlight he’s able to hunt during the day. 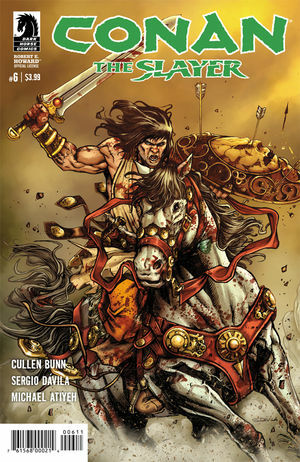 While out looking for food and runs across roman soldiers and they chase him down and corner him in a remote cave, out of nowhere his mother arrives and takes out of the soldiers, the fight leaves his mother in a weaken state so he decides to go hunt for her, meanwhile Thrax heads back to Rome. 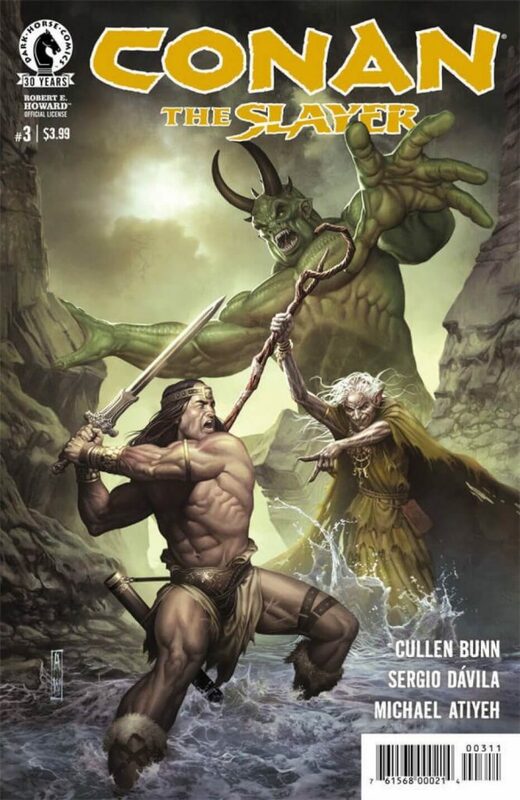 When Quinlan returns to his mother he shocked to find Thrax there with his mother’s decapitate body, finally face to face with the vampire who turned him and his mother Quinlan is to afraid to fight so he runs away. 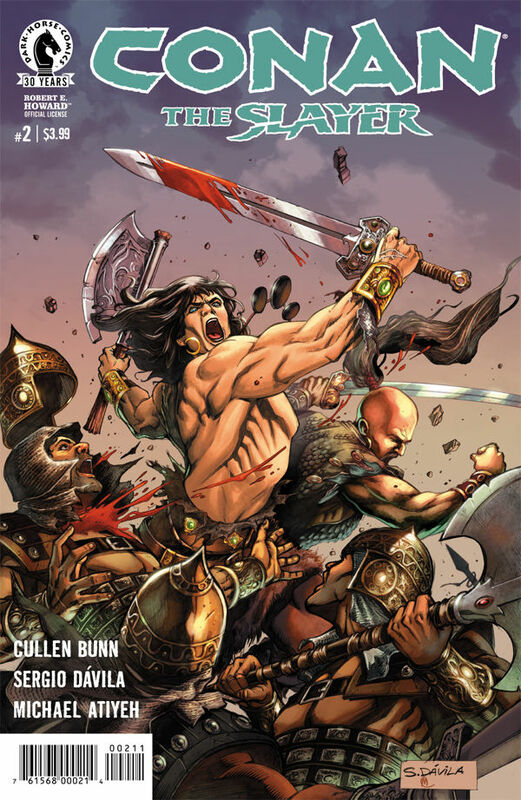 Months go by and Quinlan finds himself in Judea feeding on locals, one day come across a little boy and attempts to feed but is caught by hunters and thrown into a Gladiator school, there he meets Bruk a slave and together to two become friends with the same goal, to get revenge. 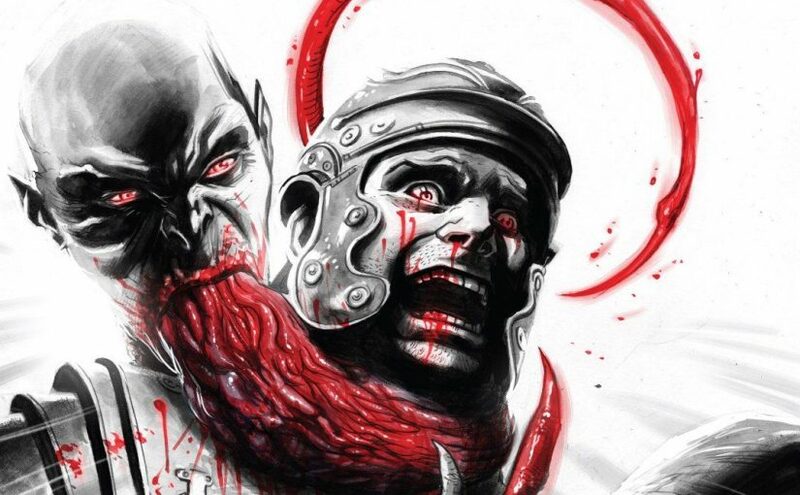 3 years pass and Quinlan becomes famous in the arena, the people call him Candidus (The White Warrior), late night another vampire sneaks in the school and attacks all the gladiators and one by one turning them all, finally we see that it’s Thrax. 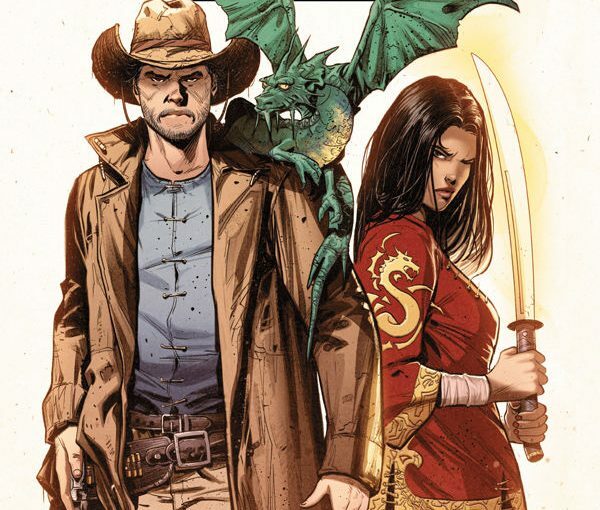 KINGSWAY WEST is an interesting tale, think once upon a Time mixed with a little Sci-Fi Western then add some Chinese folk lore and you get Kingsway west. 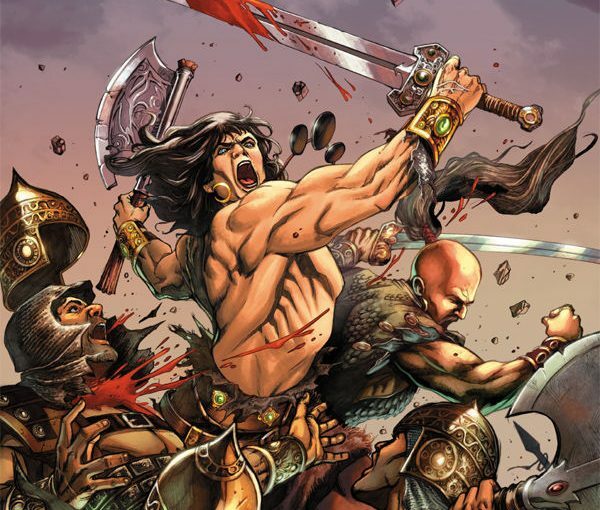 The first issue establishes the world of Kingsway and its main protagonist Kingsway Law. The world has been torn apart by war and because of that it looks as if every state has its own kingdom, when we first meet Kingsway Law he is hiding out in the snowy mountains of the Golden City Dead Zone. He comes encounters some Chinese soldiers and after a brief skirmish which leaves him passed out, he’s later found by an Mexican woman name Sonia who he ends up bonding with. The story jumps to 5 years later and now Kingsway Law seems fully adapted to the terrain, we also find out he and Sonia are married. Action picks up when a woman with a dragon comes looking for Kingsway, she approaches him and ask’s if he knew the Kingsway, not knowing if she is after his head, Kingsway decides to lie to her as the woman leaves Kingsway notices an explosion where his home is located. 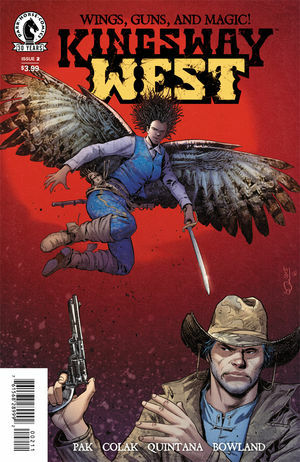 The issue ends with Kingsway arriving at the explosion site and sees the woman he had lied to earlier in trouble with nearby Chinese soldiers who are looking for red gold, the soldiers continue to push the woman around but Kingsway takes them out before they can cause more harm to her, she realizes that he is actually the man she was looking for. Meanwhile two men who appear to be at a ship of sorts are talking, a woman with angel wings walks up to them and they ask her to check out an area signal they tracked on too, it seems the two men plan on taking the red gold and using it for something big in the future. 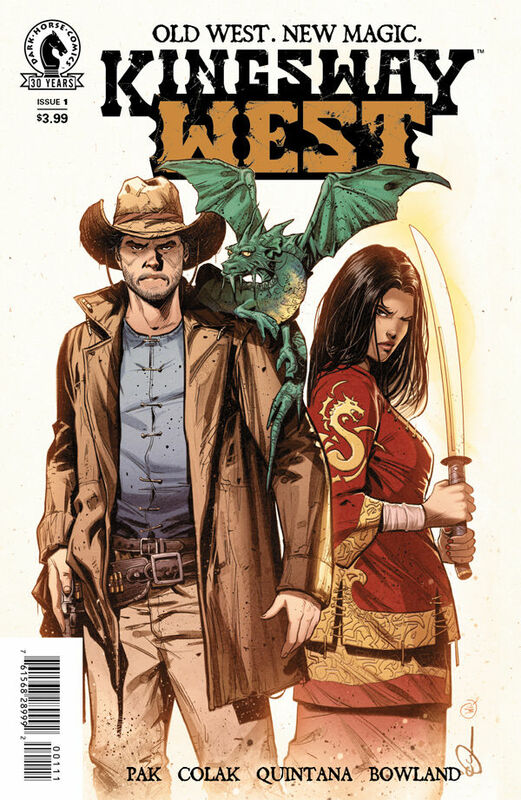 Writer Greg Pak (The Totally Awesome Hulk, X-Men) gives a Sci-Fi Western in Kingsway West, filled with fantasy elements and western culture, the world of Kingsway is unconventional which makes it a fresh and original story despite it being new. The Artwork by Mirko Colak ( Red Skull, Secret Warriors) is amazing, his work is clean and nicely detail making it easy to depict whats going on.